6 slices White any kind of Bread – we just use our normal wholemeal homemade loaf and none of that nonsense about shuicking the crusts! 10 slices thin/regular Bacon – maybe a little more as we like to wrap a strip around the base to help hold it all together. Preheat oven to 350 degrees 180 degrees in NZ. With clean hands (getting into it with your hands is by far the best way to mix a mince dish), mix the ingredients until well combined. Form the mixture into a loaf shape on a broiler pan (not too sure what a broiler pan is but the idea is to elevate the loaf so that all the fat drains away). Line the bottom of the pan with foil to avoid a big mess – this is optional as I find that there is more mess of the tray from the sauce than what drains into the base of the dish. 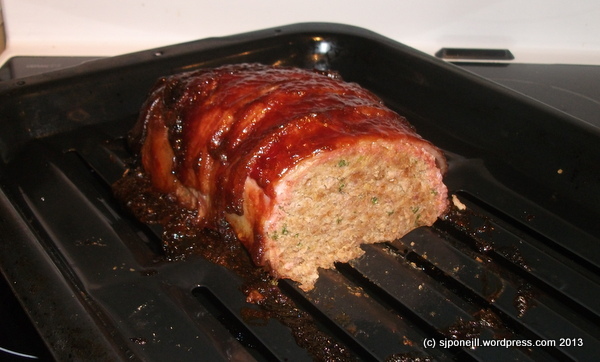 Lay bacon slices over the top, tucking them underneath the meatloaf. We wrap a strip right around the base too the help hold it together – you can never have too much bacon. 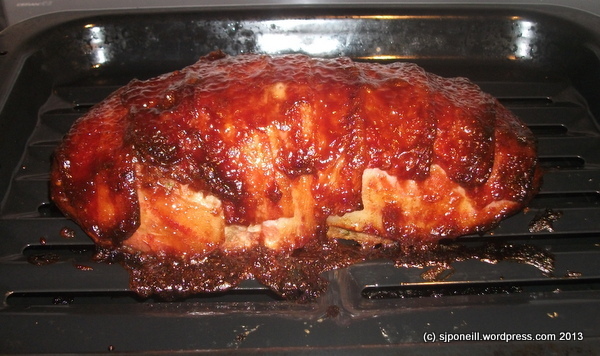 Slice and serve with remaining sauce and lashings of mashed potatoes. This entry was posted in Masterchef Raurimu, Photography and tagged mince, postaweek2013, Weekly Photo Challenge by SJPONeill. Bookmark the permalink. I found a baby one in the yard one day when I was little. Had planned to keep it, but it tunneled under the fence. Our golden retriever used to flush them out on walks. I don’t think I’ve seen one since he passed away.